This is a late 1964 Ford, ser.73257 low center of gravity. 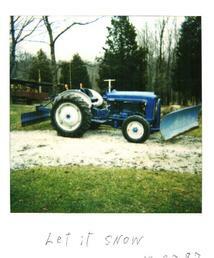 The tractor originally had smaller diameter dual rear tires industrial type. It has a Select-O-Speed transmission, a foot throttle, and hydraulic remotes. The front blade is 6 foot with hydraulic down pressure. Tire chains on rear tires are a necessity for winter snow plowing. A great snow removal machine. You just need to dress warm.